Educational studies indicate that the earlier a child can participate in a structured learning opportunity the better the chances of success. Providing learning opportunities for our community’s younger children is a priority for LPS. Preschool registration at school sites Jan. 28-29, 2019. See individual school websites for more information. Preschool programs are available for children who are three years old by October 1st. Students who turn five years of age by October 1st attend kindergarten. At Littleton Public Schools, we pride ourselves on kindergarten programs that are child-centered and meet the needs of the whole child. Children receive a balanced program to meet their individual needs for cognitive, social, emotional, and physical growth. Our goal is to start our youngest learners on the road to a lifetime of success through a love of learning. The state of Colorado funds all half-day, and a few full-day, kindergarten programs in its public schools. Because we believe strongly in the importance of early childhood education, all LPS elementary schools also offer a variety of full-day kindergarten options. Some are tuition-based, and some are free, funded through state and federal monies. In addition, all LPS elementary schools offer tuition-based before- and after-school childcare. Please visit specific school websites for more information. Kindergarten today is more academic and more challenging than programs of the past. While still based on an atmosphere of inquiry and play, it is the kind of active learning that teaches children to think, solve problems, share ideas, and learn language development skills. As your child’s first teachers, you can help prepare your child for kindergarten. Children at the kindergarten level need to have their creative skills challenged. Exposure to many types of learning helps to develop the whole child. Encourage your child’s natural curiosity about his or her world by asking questions and pointing out things to see, hear, touch, taste, and smell. Encourage painting, use clay, draw with chalk, markers, and crayons. Encourage dramatic play such as pretending, playing dress-up, setting up housekeeping, playing school, and playing with small objects, such as cars, blocks, etc. Sing songs, dance, listen to all types of music and play rhythm instruments. Tell stories or have your child finish a story you start. Listening, speaking, reading, and writing are all important to your child’s development and success in school. Talk with your child and listen carefully to what he or she says so you can have meaningful conversations with your child. Read aloud with your child every day for at least 20 minutes. Encourage your child to predict what will happen while reading stories and to retell the story. Play rhyming games with words. Help your child practice writing his or her name. Practice writing notes, letters, and stories, even if your child uses pretend writing or scribble writing. Allow your child to dictate stories and letters or notes while you write them down. Kindergarten math builds the groundwork for later mathematical understandings. Working with objects and manipulatives, grouping, sorting, problem-solving, patterning, and estimating are all part of the kindergarten curriculum. Sort and group stuffed animals, cereal pieces, candy, rocks, and toys. Practice address and phone number. Practice writing numbers to ten. Create patterns with simple objects. Kindergarten registration will be held at each elementary school on January 28 and 29, 2019. 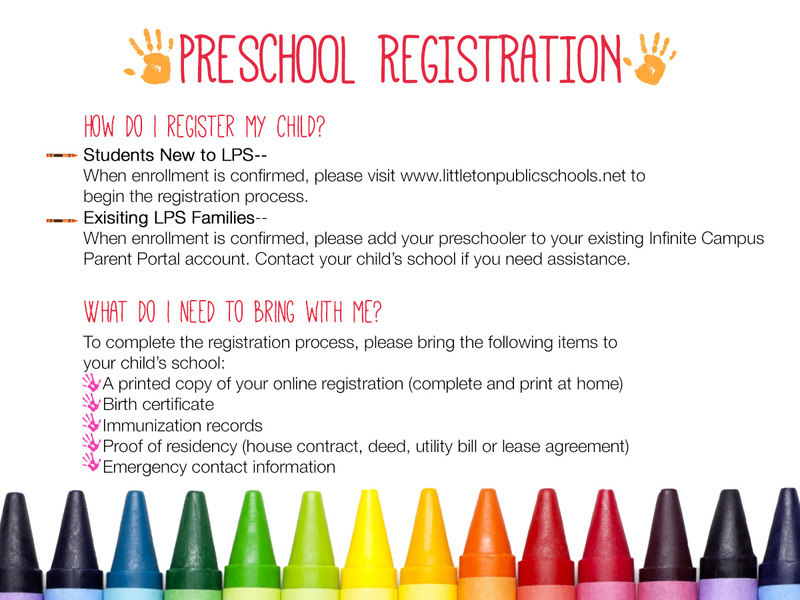 You can register your kindergartner by completing an online pre-registration form and visiting your local school. For more information, download our Kindergarten Brochure. Click here to review Registration Procedures and learn more!